One of Queen’s most memorable records was a tough one to recreate in a live environment. The 1977 song “We Will Rock You”—written by guitarist Brian May and produced by Mike Stone and the band—achieved its singular percussive quality by means of the band members overdubbing themselves clapping and stomping again and again. Aside from that and a fuzzy guitar lead at the end, there’s no musical accompaniment to the thunderous vocals. It wasn’t a perfect fit for stadium gigs. 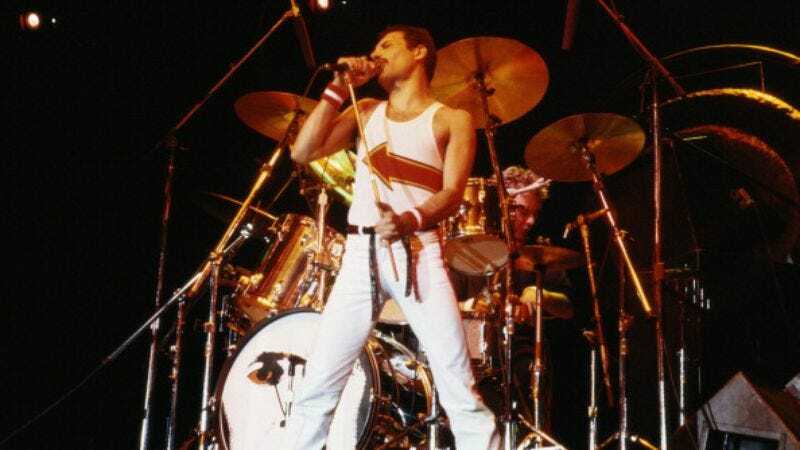 So, when they got onstage, they usually performed a different version of the songs—the “fast version,” up-tempo with a traditional chord structure and lots of opportunity for Freddie Mercury to strut around the stage like a Zanzibari jungle cat. Unfortunately, while there are a bunch of bootlegs of a 1977 John Peel session floating around YouTube, there’s never been a cleaned-up copy suitable for an audiophile’s top shelf. Until now. The band is finally releasing Queen On Air: The Complete BBC Sessions as a 2-disc set, and wouldn’t you know it—that ’77 Peel recording of “WWRY” is included, Rolling Stone reports. “This is one of the great unreleased Queen gems,” according to Daniel Nester, author of God Save My Queen. “It’s just really nice to have clean official versions of these. None of the News Of The World-era [BBC sessions] have been officially released,” he explained in an email correspondence with The A.V. Club. “Queen’s reissues are notoriously stingy. This is pretty good actually.” Queen On Air will be released everywhere on November 4.